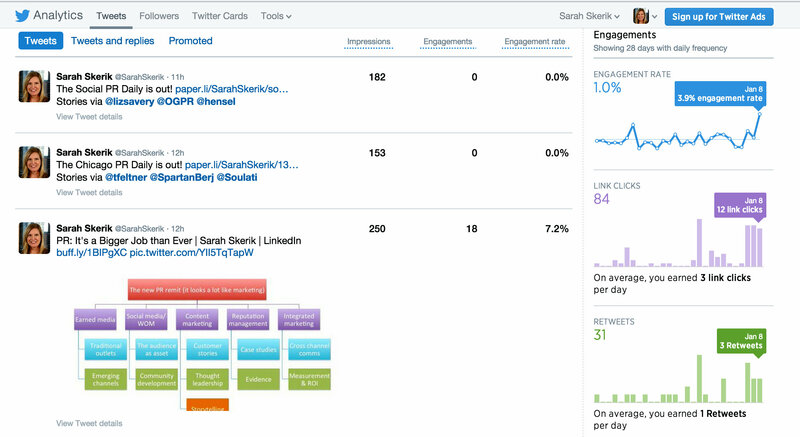 Twitter analytics reveal audience engagement per-tweet. I actually had to read the article twice to convince myself I was reading it correctly, because in my experiences both as a social media lead and a digital marketer, engagement – specifically, the number of times members of my audience liked, shared, favorited, retweeted or commented upon the brand’s content – was a number I watched closely. To be fair, it is important split some hairs when it comes to the definition of organic social reach. There’s no doubt that social networks are limiting (if not almost entirely quashing) the reach of promotional content. However, non-promotional content appears to be relatively unscathed. There are still plenty of opportunities for brands to build relevant social audiences. And engage with them. In fact, engagement is one of the most important outcomes brands can generate with their digital content. Here are the reasons why. 2. Engagement data is potent business intelligence. The engagement rates of the social content your brand publishes provide a rich source of data about your customer preferences that should not be ignored. Taking a deep dive into your engagement data is useful from business intelligence standpoint, revealing in stark terms the truth about the topics that not just interest your audience but engage them. Taking the time to analyze the data enables a brand to look beyond the content that was popular but didn’t drive any further action on the part of the content consumer. And what’s the value of that sort of fleeting impression? In my opinion, it’s close to nil. Engagement can also be an early indicator of more valuable interactions with content, such as lead generation, and can even be a predictor of lead quality. Using engagement data, marketers can identify the messaging that delivered higher quality, more motivated audiences, enabling them to continually hone campaigns and content to improve marketing effectiveness. 3. Engagement influences search rank. It’s becoming increasingly clear that engagement is an incredibly potent signal that drives search rank. The pantheon of digital touchpoints brands have across the web — within the sphere of their own websites as well as social channels and the the many linked and unlinked mentions of brand terms and related keywords – all represent engagement opportunities, and search engines track related audience behavior. Rand Fishkin (@randfish) of Moz.com called this out in a post a couple weeks ago (The Massive Ranking Factor Too Many SEOs are Ignoring) noting that most SEOs are not optimizing online presences and content for engagement, in order to earn relevant traffic. But what if my brand’s engagement rates stink? It’s time for some tough love. If engagement rates are low on your brand’s social channels, well, that’s a big red flag you. Simply put, your audience is telling you in no uncertain terms that the social presence isn’t very compelling. If that’s the case, stop what you’re doing immediately, spend some time assessing social media presences within the space you admire, and learn from them. Chances are excellent that you’ll find that they put serving the audience interests first, and make sharing useful and interesting information a priority. They are not continually exhorting the audiences to check out their products or hawking promotions. Good social presence is also give more than they get, in terms of sharing third-party content, mentioning others’ handles, and retweeting others. The Golden Rule of “do unto others as you would have them do unto you” definitely applies in social. If you want your audience to like, share and retweet your content, you need to do the same with theirs. Speaking of lousy engagement – there have been a lot of histrionics about Facebook’s treatment of promotional content published by brands. There’s more to the social web than just Facebook, despite Forrester’s current obsession with (and dim view of) that particular network. It’s true that Facebook has ratcheted back on the organic reach of promotional content published by brands. However, fun, useful and interesting content that is curated, created and/or shared by brands is doing quite well, and appears to be unscathed by Facebook’s algo changes. If your brand is delivering value to your audience, Facebook (and other social channels for that matter) will work just fine. According to the Sprout Social Index published late last year, the number of inbound social messages to brands that require response has grown by 100% in the last year. Clearly, audiences expect brands to engage. This does not strike me as the time to take the foot off the gas with respect to generating and measuring social audience engagement. There’s too much at stake for digital marketing efforts across the board. If you ditch measuring engagement and to go straight to measuring business outcomes, for example, you’ll be left with a lot of gaps between the content and the conversion that the social data could explain. You’ll miss out entirely upon the opportunity to understand more about your market’s behavior than could ultimately help you improve marketing efficiency. So don’t throw the baby out with the bathwater. Measuring social engagement is not the same thing as going on a unicorn hunt. Creating content that engages and attracts audiences will provide brands with a more durable audience as well as increased value from marketing content over time. More than ever, developing dexterity when it comes to measuring engagement is crucial for marketers in the coming year.